Daniel 7:9-10, 13-14 — the majesty of the Ancient of Days. A glimpse of heaven for Daniel who sees amid a myriad angels attending the throne of God the honouring of “one like a son of man”. John 18:33-37 — Jesus is questioned by Pilate about who He is. 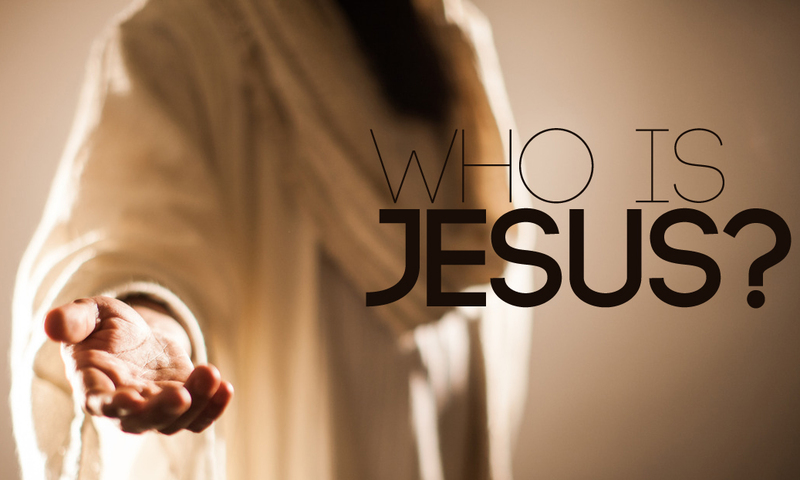 Jesus explains that He is no political figurehead but His kind of kingdom is rooted elsewhere. “The utterance of the man exalted” – testimony to God’s work through his life, having been raised up as king of Israel, from shepherd to ruler, 2 Samuel 7ff; like the Bible’s wisdom literature, what follows contrasts just rule in the fear of God with un righteous leadership. 2 ‘The Spirit of the Lord spoke through me; His word was on my tongue. “Spoke through me” – not presumptuous, but in awe at God using Him prophetically. 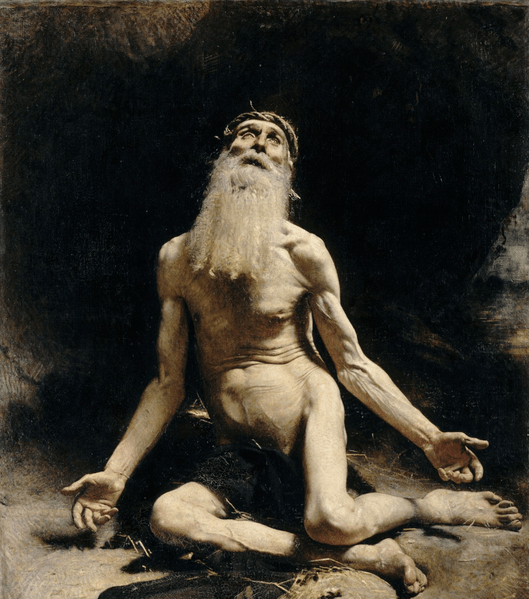 “When one rules… in righteousness… in the fear of God” – in the style of a prophet, David sets out in bold strokes a picture of a God-centred ruler – unmistakably alluding to the One he foreshadowed, Jesus Christ. surely He would not bring to fruition my salvation and grant me my every desire. “An everlasting covenant… secured in every part” – even though his household had failed God, David believes rightly that God’s promise recorded in 2 Sam. 7:12-16 will hold good with a descendant of David as the Eternal King, fulfilled in Jesus Christ when He return to rule in perfect justice and peace. For further study, similar prophecies in Isaiah 11:1-10; Jeremiah 23:5-6; Jer. 33:15-18; Zech.9:9-10. Fulfilled in part, Matt. 4:14-16; Luke 24:25-27,44-49; John 5:45-47; John 8:28-29. 6 But evil men are all to be cast aside like thorns, which are not gathered with the hand. “Thorns” – worthless but also dangerous, needing to be shifted with an weapon or implement. “Burned up”, literally ‘consumed with fire in the sitting’ or as we would say, on the spot. For God’s judgment as fire, see Isaiah 9;18; 10:17. The fate of the rebellious when the Messiah, in fulfillment of the Davidic Covenant finally establishes His rule on earth, Isa. 63:1-6. 9 ‘As I looked, ‘thrones were set in place, and the Ancient of Days took His seat. His clothing was as white as snow; the hair of His head was white like wool. His throne was flaming with fire, and its wheels were all ablaze. “The Ancient of Days” – pictures God as a king of great power and immense maturity giving judgment in court. The description symbolises His wisdom in white hair; righteousness by white clothing; and power in judgment, as fire. The description is similar to that of an angel in Matthew 28:3 and Jesus in Revelation 1:14. 10 A river of fire was flowing, coming out from before Him. Thousands upon thousands attended Him; ten thousand times ten thousand stood before Him. The court was seated, and the books were opened. “Thousands attended” – a very great number of angelic beings stood before Him. John also recorded that there ‘thousands and millions”, i.e. too many to count, surrounding God’s throne and ministering to Him. Angels are spiritual beings created by God for worship and for mission (like us) who, largely unseen, help in carrying out God’s work on earth. 13-14 ‘In my vision at night I looked, and there before me was one like a son of man, [enash] coming with the clouds of heaven. He approached the Ancient of Days and was led into His presence. He was given authority, glory and sovereign power; all nations and peoples of every language worshipped Him. His dominion is an everlasting dominion that will not pass away, and His kingdom is one that will never be destroyed. “One like a son of man” – an Aramaic phrase ‘bar enash‘ meaning a human being, a phrase used throughout Ezekiel e.g. Ezek. 2:1,3,6,8. But this appearance is clearly not a human being, but “one like a son of man”, a description that the various authors of the NT were quite sure referred to Jesus Christ and probably what was in Jesus’ mind when He used this of Himself, Matt. 8:20. Hence the translation used here. There is more than one time-frame in view. At the end of history, the NT references these verses to teach us that Christ will return, riding the clouds to finally confront evil and enforce its defeat. For further study: Matt. 24:30; Mark 13:26; Mark 14:62; Luke 21:27; Rev. 1:7. IN PRACTICE The first aspect of who God is comes through David’s final testimony about ruling in the fear of God, and Daniel’s picture of awe as he is given a prophetic insight into the heavenly court – and the Ancient of Days. At first living, and especially leading, in the fear of God looks like lahigh risk venture. Do we bring on ourselves fire and brimstone or other destruction if we get it wrong? The history of northern and then southern kingdoms of Israel falling, and the misery of people being enslaved in exile, underlines the cost of getting it wrong, but this is in the context of having rejected countless warnings and appeals by God’s prophets. However, remembering that the Bible teaches us plainly that God is love, and his overriding character qualities are mercy and truth, there is a truth here about whether we really know God, and as a consequence desire to live out His character. This is the fear of missing God best and God’s pleasure in us. For Christians, who come to know God personally through embracing Jesus, our grasp of the Lordship of Jesus on our lives and our church involvements is crucial. When relationships get strained, or vision confused, it is a fair assumption that what has slipped has been the awe, or fear, of God through knowing Him and loving His ways. QUESTION Daniel’s vision of thousands and millions in the heavenly court was extraordinary and unrepeatable. What kinds of spiritual practice help us to have some sense of a glimpse of heaven and the majesty of the heavenly court? “Are you…” – Pilate’s first words to Jesus are the same in each of the four gospels. There were two possible questions here with different political overtones – was Jesus a rebel leader in opposition to Roman rule, or was He the Jews’ religious leader, the Messiah? “Pilate replied” – he is exasperated, despising the Jews and their ways and not wanting to get involved with their affairts, yet seeing no real basis for their extreme animosity. Ironically, he ends up supporting their position in which we see God’s providence in allowing Jesus to be executed by being ‘lifted up’ and not by stoning, as Jews were inclined to do. “My kingdom is from another place” – heaven is the place of eternal and absolute truth. Jesus came as the Way, the Truth and the Life, John 14:6. Relationship with Him is the only way to God and the only means of that life-bringing truth being revealed – a conundrum for intellectual theologians because it is not logical or understandable. Jesus came as living truth for all who would receive Him. Pilate, a politician, considered all truth relative in the shifting sands of people’s opinions; however Jesus of Nazareth and his philosophical-sounding answer did not present as a threat to law and order. IN PRACTICE The second aspect of who God is, concerns the Son of Man who Daniel sees in his vision, approaching the Ancient of Days. On earth this picture is recalled, ironically, as Jesus of Nazareth is brought before Pontius Pilate. The Roman governor Pilate was used to factions, pressure-groups and politics in general. Appointed as Prefect of the Roman province of Judea, he encountered the religious politics of Jews and Samaritans, eventually being recalled to Rome after complaints from both. So it is not surprising that when Jesus of Nazareth was brought before him by the Jews, he saw Him at first as yet another political activist. Jesus immediately corrected that perception with His statement: “My kingdom is from another place”. The lesson for us is that human politics on earth and heaven’s purposes follow different agendas. There are spiritual connections – and tensions – between the two. We often pray and expect answers as though the kingdom of God and our world dominated by man’s organisation and control were the same, but the reality is that we pray through Jesus, who is the king of “a kingdom not of this world”. The better we know Jesus, the more we will discern His kingdom, and the more clearly we’ll see the difference — and learn to live and pray in the right alignment with what He is doing. PRAYER Lord, I say you are a king – the king, King Jesus, to whom all authority is given. Help me to hold less tightly the priorities that seem to apply on earth, and to begin to see matters from a different perspective – Your heavenly perspective. “The seven churches” – the letters were addressed so they could be sent out and passed on via the Roman road which ran north of Ephesus and then in an arc inland and back towards Ephesus, connecting the Roman province called Asia in modern western Turkey. “Seven spirits before His throne” – better, ‘sevenfold spirit’ as NIV footnote. The number seven symbolises completeness and perfection. There may also be an allusion to the ‘angels of the seven churches, Rev. 1:20. 5 and from Jesus Christ, who is the faithful witness, the firstborn from the dead, and the ruler of the kings of the earth. 5-6 To Him who loves us and has freed us from our sins by His blood, and has made us to be a kingdom and priests to serve His God and Father – to Him be glory and power for ever and ever! Amen. “Who loves us… has freed us…has made us…” – stated as present-time blessings. There is a dimension of the kingdom of God (God’s reign bringing God’s order) which is not just anticipated when Jesus comes again, but in some measure experienced now. “A kingdom and priests to serve” – here, clearly and simply, is set out the essential difference between the Old Covenant way of relating to God (rules, hierarchical and formal rituals, led by a special order of priests who make connections by proxy, with God who is holy and remote) and the New Covenant (freed from the burden and guilt of sin by Jesus’ blood and now able to draw close to God as those who know Him and know His love, to serve Him in worship and mission without intermediaries). The human tendency is to revert to what is more ordered and more controlled, requiring less personal investment and responsibility, which is why the New Covenant remains a challenge for much of the Christian church today. As Jesus taught, the ‘taste of the old wine’ seems preferable. 7 ‘Look, He is coming with the clouds,’ and ‘every eye will see Him, even those who pierced Him’; and all peoples on earth ‘will mourn because of Him.’ So shall it be! Amen. “The Alpha and the Omega” – the alphabet is an ingenious way of representing knowledge through words. Christ, the Living Word, is supreme in this, ruling sovereignly over all human history including the part that for us has not yet unfolded. “All peoples on earth will mourn” — rejoicing at the return of the Messiah by those that are His, swept up in the air to meet Him, 1 Thess. 4:16-17. Others, the ones still on earth, mourning their sin and judgment. The combined quotation headlines the theme of Revelation, the sweepingly majestic yet human-related Lord, Daniel 7:13 who evokes both the sorrow of sin in the face of One so holy but also finding grace, Zechariah 12:10. IN PRACTICE The third aspect of who Jesus is, also says a lot about who we are.. Not only does His shed blood remind us powerfully of His love for us, we are reminded of the power of His blood in freeing us from sin, and from the subtle accusations of the enemy trying to gain a point of access into our thought lives. Why does this matter? It is because the Son of God enthroned in the heavenly court needs those who have stood at the Cross, who have given their pride and their self-sufficiency to Him, to be His partners in bringing His Kingdom. That is why He has conferred a new kind of priesthood on all He knows as His, a holy community where His rule and authority enriches life and relationships. It’s the priesthood of believers, of fellowship in the Great High Priest – the highest distinction. It’s easy to look around and see, where the believers are bringing the presence of Jesus and making a difference in the world. It looks different from the stereotype of the institutional church. These are the ones who know they have been freed, who know they are loved, and who are serving him in worship and mission through transformed lives. QUESTION What is meant by priesthood in the post-resurrection New Testament? What should we call those who are set apart and trained as preachers, shepherds and leaders in the church? PRAYER Lord God Almighty, may we grow in loving You and walking in awe of You, as we seek to represent You to our world, and bring the needs of our world to You. Anointed by the Spirit of praise and joy to rebuild, restore and renew. The anointing of the Spirit is an anointing as both kingly authority – proclamations are what kings do – and as a divine servant, with concern for prisoners and the poor and practical involvement with those who are destitute. This brings together Isaiah’s earlier prophecies of a king to arise, and also the suffering servant of the Lord. Isaiah spells out Jesus Christ in all but name. This is a well-known passage. Why? Because Jesus applied it to Himself. 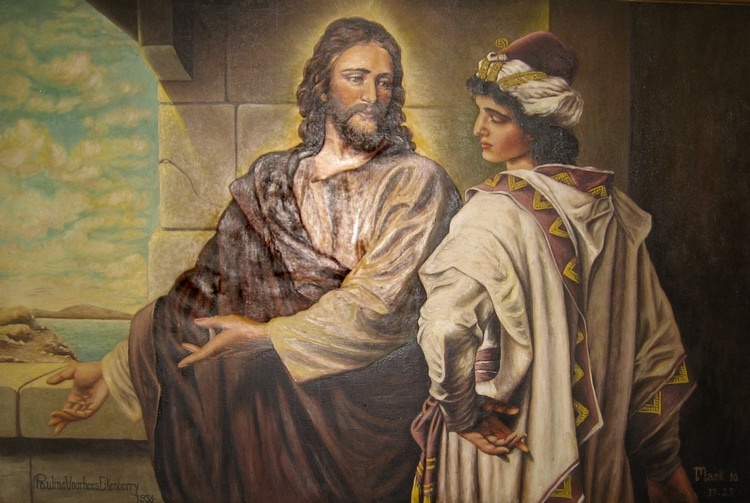 Following His encounter with the Holy Spirit in baptism and testing in the wilderness, and soon after the start of His public ministry, Jesus attended the regular synagogue worship in Nazareth, in the synagogue He had known from childhood. Synagogue worship was relatively free, with ministry shared. He stood up to read Scripture and was handed the Isaiah scroll. He read the beginning of Isaiah 61 (above) and then said, to the amazement of His hearers, “Today this Scripture is fulfilled in your hearing” Luke 4:16-21. Jesus, in His reading of this, ended as above “to proclaim the year of the Lord’s favour”. He saw His call as divided into two visitations, the first to bring salvation and freedom and favour with God, which we now understand as His human sinless life and giving up that life on the Cross. The second includes the judgment and realised kingdom of God, which fits with the Second Coming. …and the day of vengeance of our God, to comfort all who mourn and provide for those who grieve in Zion – to bestow on them a crown of beauty instead of ashes, the oil of joy instead of mourning, and a garment of praise instead of a spirit of despair. They will be called oaks of righteousness, a planting of the Lord for the display of his splendour. “The oil… and a garment…” is a picture of something applied and put on, an impartation. The language of anointing and oil is often used symbolically of the Holy Spirit. So this is describing an impartation which brings dramatic change to those receiving it from mourning and despair, to joy and praise. Without Jesus this life is a slow dying with a grim outcome. Receiving new life and eternal life in a new spiritual birth is coming alive in Christ with a release into the Holy Spirit’s expression of joy and praise. The immediate meaning of this for the original hearers is about coming out of exile and rebuilding the ruins, as documented by Ezra and Nehemiah. Isaiah saw this restoration, but also a restoration of God that affects every age. For us, the impartation of the Holy Spirit and the life of the Spirit is about being empowered as God’s agents of restoration and transformation. Those who demonstrate the Life of the Spirit are those who will, simply through their lives, bring renewal of church and also society, ministering in Word and Spirit and in engagement with the world that doesn’t necessarily own Christian beliefs or values. The community of the people of God are covenanted (for us, under the New Covenant in Jesus) to imitate and display the character of God, who stands for justice and is set against wrongdoing, Micah 6:8; Isaiah 35:15. The people of God are those who represent and uphold God’s values. Clothed with salvation, arrayed in a robe of righteousness is a description of how righteousness with God is put on us as part of the faith relationship; we have to come to the point of realising that we cannot earn or achieve any of that righteousness. The theological term is “imputed”, meaning it is assigned or attributed to us through our new standing in Christ Jesus. “God made him who had no sin to be sin for us, so that in Him we might become the righteousness of God”, 2 Cor. 5:21. Both of these verses are major statements of how God sees us in this spiritual transformation. This is the heart of the New Covenant for those who give their lives to Jesus. In Christ Jesus, as people of new creation with a new nature, we become — and are the demonstration of — what God’s righteousness looks like. 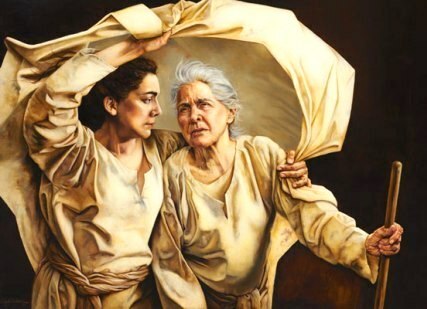 Isaiah foresees a Holy Spirit anointed ministry, the characteristic of which is freeing and transforming of people, vv. 1-2, communities, v.4 and values, vv.8-9. This is a broad-brushstroke picture of what the ministry of Jesus the Messiah would look like. The same Holy Spirit is the enabler of the purposes of God in bringing to bear His kingdom order in all the dimensions of spiritual salvation, physical and emotional healing and deliverance from oppression, as demonstrated by Jesus. The same Holy Spirit empowers the same purposes of God in us, giving us a growing revelation of how we are to continue Jesus’ ministry, and building our confidence in it. The same Holy Spirit transforms how we see ourselves. The revelation of how God sees us “clothed” in Christ Jesus transforms our confidence from tentative prayer requests to declaring in faith and spiritual authority what we know God has already said. 1. If Jesus took this passage (the first two sentences at least) and applied it to Himself, how might it apply to us? 2. How does the Sovereign Lord “make righteousness and praise spring up” before others, today? The early Christians faced the risk of death with the joy of being counted worthy to suffer — quite possibly in martyrdom (the word martyr has the root meaning of ‘witness’). The monastic movement was based on communal life around the discipline of 24-7 worship. Religious Christianity grew up as the early community-based Celtic tradition gave way to a more disciplined and church-based Roman practice which emphasised obedience. The Reformation 500 years ago challenged this. Priest became pastor (shepherd) with a return to Scripture as the foundation of faith, and salvation as a Scripture-informed choice to put faith in Jesus. John Wesley, an Anglican cleric who had experienced a profound encounter with God, preached to huge outdoor crowds but relied on discipling new believers in small groups in homes for mutual discipleship and spiritual growth. This ‘high churchman’ actually declericalised the church by equipping ‘lay’ people. Revivals have been born in a discipline of prayer and repentance, from the 100-year-long prayer meeting in 18th-century Moravia onwards, through Georgian and Victorian England to more recent times. The priority of taking the Good News and its lifestyle into the streets and pubs of the poor and needy of the expanding cities took Wesley’s values forward and presented church as a radically alternative mission army for social, as well as spiritual, transformation. The Pentecostal and charismatic renewals of the 20th century brought a new understanding of relating to all three Persons of the Trinity and believers being empowered by the Holy Spirit for lives of intimacy with God and engagement in the mission of God. More recently, traditional streams which grew up from all of the above have given way to highly contemporary forms of church and new expressions of church, with the beginnings of a fusion of formerly separate, competing institutional silos into an organic movement. Being who the Lord says we are as His children, working this out by engaging with the world, prepared to witness at personal cost, practising worship in all of life, loving the renewing Word and loving the selfish world with Jesus’ love, empowering and direction – and proclaiming the kingdom of God over and above the claims of man’s understanding of church. God’s announcement of His intentions through Isaiah look far ahead through the coming judgment and exile which Isaiah ‘saw’ but did not experience, to a time of restoration and preparing for the new era of the Messiah’s coming. God wants His glory to rest in the land. Therefore He has promised the peace of ongoing salvation to those of His people who fear Him, Psalm 85:8-9 , and sent John the Baptist as a herald of His Son who is the bringer of peace through salvation. Jesus, having completed His mission on earth, and ascended to His place of authority in heaven, will return, unannounced, to affirm those who are continuing in His way, with inevitable judgment for those who are not. Our mission is no more or less than to join God in His mission: to announce His Good News for all who will receive Him, prepare the way for His present working and future coming with encouragement for people to turn back to Him. All this, with the forebearing and loving patience of our gracious God who is “not wanting anyone to perish, but everyone to come to repentance”, 2 Peter 3:9. In what ways do we need God to revive us again? What does He look for, to be able to do this? What does this psalm tell us, that holds back revival? Is this turning to Jesus one particular, memorable life event? Or are there many turnings, some particularly life changing and significant, others which are more of a regular course correction? Can it be that simple? Why is it that we feel more comfortable engaged in practices and actions that amount to earning favour with God? Are we, like God, lovingly patient and persistent with those who are not yet in a place to turn to God and confess their need of Him?